In this excerpt from his forthcoming book on non-fiction in South African literature, Experiments with Truth, Hedley Twidle revisits Dugmore Boetie’s Familiarity is the Kingdom of the Lost, a memoir first published in 1969 with a revealing afterword by its editor (and enabler), Barney Simon. As I began to give a cautious yes, the large man was shooed away by a smaller man in a high-vis jacket that read CCID (Central City Improvement District). 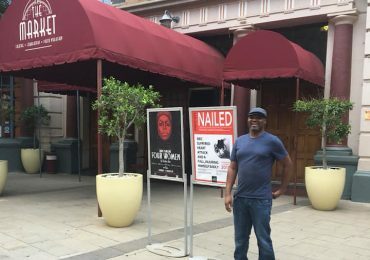 ‘They know you like to talk, Nigerians,’ he said: ‘Be aware’. Further down, the CCID had set up some large screens on which you could watch footage (taken by security cameras on Long Street) of people being mugged, pickpocketed and scammed. The jerky black and white clips had been edited into a range of informative segments. The dangers of the open bag or the visible iPhone; lightning fast card swaps by people offering help at cash machines. A more elaborate version of this is the ‘false pop-up’. Fraudsters tell tourists that they need a special permit to walk down a street, since it is closed for a film shoot, but that this can easily be obtained from the nearest ATM, and let me help you with that. There was also footage of the Shoe Scam—a ‘man particular’ con—which a friend of mine had recently been a victim of. Staggering along drunk at night, he suddenly had someone beside him saying ‘Hey brother, we’ve got the same shoes!’, grabbing him by the shin, pulling up his trouser leg and comparing sneakers. This, the video explained, was a textbook diversion and desensitisation technique. It draws attention to the shoes with one hand while the other snakes round to remove a wallet, which is then swiftly passed to an accomplice walking in the opposite direction. Long Street was closed to traffic for the evening, and a crowd had gathered. People were mesmerised: to see something so furtive and fast captured in the grainy footage. To see the obliviousness, the ease, the skill of it, the way pickpockets moved when in the act, so that even the rest of their bodies seemed unaware of what the one frantic hand was doing. 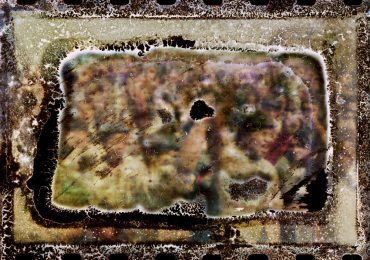 The woozy surprise and confusion of the marks, then the sudden realisation—it was all there in archival black and white, ‘Recorded at 00:43 a.m. on Long Street’. The scenes were so transfixing that a rumour, or perhaps it was a joke, began to run through the crowd: people were being so drawn in by these on-screen cons that they were being pickpocketed, again, in real life. In his Afterword to Familiarity is the Kingdom of the Lost (1969), the book’s editor and co-creator Barney Simon strikes a complex note of fondness, confusion and exasperation. Giving an account of working with ‘Duggie’ in the last two years of his life, the piece is a frank and unflinching account of narrative collaboration across the ‘colour bar’. Writer and theatre-maker Simon pays tribute to Boetie as both irrepressible story-teller and friend, but also as inveterate liar and scam artist: ‘Duggie was essentially a con man, so that attempts I have made to establish the facts of his life have led only to chaos and contradiction’. Even while half-suspecting that he was being taken in (part of the strange psychic architecture of the confidence trick: you always half-know you are being duped, you collaborate in your own humiliation), Simon worked with Boetie for the next two years, supporting him financially and slowly drawing out of him enough material for a book. It appeared only after its protagonist had succumbed to lung cancer—an ordeal that Simon becomes deeply and sometimes uncomfortably involved in. 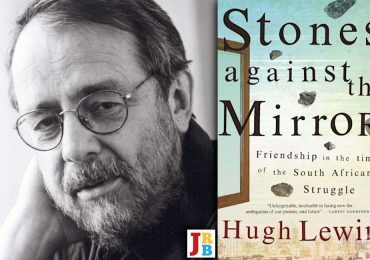 During his visits to Boetie in hospital, it slowly emerges that this supposed autobiographer has fabricated all the most important plot points of his life: among them the grisly death of a tyrannical mother in the opening lines of the book (she eventually appears, as a sweet old woman, at Duggie’s deathbed). And also the loss of his leg, which happened when he was a child, not when heroically fighting Rommel in North Africa. Simon’s deeply felt essay registers both the intimacy and contempt bred by Familiarity—a book which could be described both an act of sincere and deeply felt narrative collaboration but also a project of mutual, long-term duplicity with many flash points. Now I knew the score. The lies. The cons. Those hospital trips to the ‘loner’. Even the money for the old woman hadn’t reached her. But he was there. On my back. For the rest of his life at least. I hated him. He hated me. I just wanted to walk out, to be left alone. Rather than providing the kind of usable testimony and solidarity expected of apartheid autobiography, Familiarity enacts ‘a literary con’ (as one reviewer put it) in multiple senses. It is firstly the picaresque account of Boetie’s life as thief, confidence trickster and convict: a rollicking and often very funny narrative of its one-legged subject’s adventures as scam artist in Johannesburg, Cape Town and Durban. The narrator takes the reader through an encyclopaedic catalogue of rip-offs, swindles and hoaxes, often pandering to the prejudices of white South Africans in order to dupe them, or else matching the absurdities of apartheid bureaucracy with the narrator’s own surreal gambits. ‘This is beyond me. I looked it up in all the prison rule books but I can’t find anything that says that this convict is not right’. 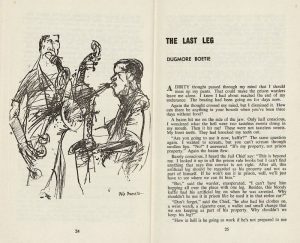 The Last Leg, as it appeared in The Classic. Facing illustration: ‘Jazz drawing’, by Nils Burwitz. 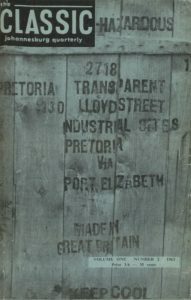 Source: Historical Papers, Wits University. The jolter will jolt, she’ll look up to be met by a ‘Sorry, madam’. This gives the ‘can-opener’ a chance to unbuckle the bag. At the same time the square-puller will come in between them and lift the square. We never miss, because there’s no stopping, no hesitating, no pausing, it’s just one smooth movement. Clear, straight and neat. Drawn to the arcane narratives of ‘non-political’ (i.e. 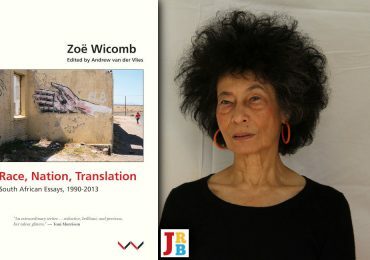 common-law) prisoners, these literary cons are experimental outliers within the genre of the South African prison book. They form a counter-tradition to the many anti-apartheid autobiographies that seek to build needful solidarity and an archive of testimonial data. They also trouble the divide between criminality and political resistance within an unjust society—a zone of constant ambiguity and ideological anxiety within many Struggle memoirs (and the TRC itself). In telling the self-mythologising stories of Wentzel and other gang members, Steinberg must sift through the self-conscious performance and even deliberate duplicity of compulsive storytellers who want their wisdom affirmed but are nonetheless wary of releasing too much of the information that their community holds in trust, or spending their narrative capital too quickly. 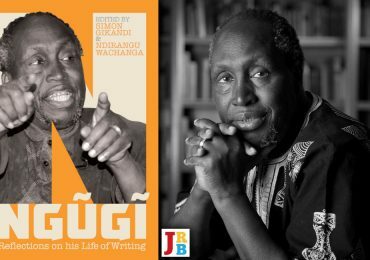 A social scene irredeemably warped by reciprocal stereotypes and racial caricatures; interpersonal encounters where (in N Chabani Manganyi’s deft phrase) ‘culturally activated transferences are easily traded for truth’—it is in these psychological domains that Dugmore’s con tricks operate, albeit in a lighter, more irresponsible mood. The Dugmorean hoax plays within the dynamics of mutual self-deception, ironic politeness and (in Homi Bhabha’s phrase) ‘sly civility’ that pass between black and white. Such dynamics are recorded with lacerating frankness in the very different mood of Bloke Modisane’s Blame Me on History (1969)—a work that appeared in the same year as Familiarity but which is trapped in a syndrome of doomed liberal humanism, sincerity and corrosive ‘honesty’ that Boetie’s narrator has taken for all it was worth and then gleefully abandoned. The white man of South Africa suffers from a defect which can be easily termed limited intelligence. […] I say this because no man, no matter how dense, will allow himself to be taken in twice by the same trick. They don’t learn from their mistakes, for the simple reason that they’d rather die than talk about their mistakes. Me, I learn by my mistakes because human beings make mistakes, and I’m a human being. Their pride is based on colour, and it’s on this pride that we blacks feed ourselves. Call him ‘Baas’ and he’ll break an arm to help you. He takes advantage of his white skin, we take advantage of his crownless kingdom. ‘Tell me now,’ she was almost begging, ‘do you for one minute think that if anyone could steal a roll of pounds he’d be so stupid as to stand and wait for a measly fourpence change when the door was wide open and he had every chance of running away? I,’ she spat, ‘would give everything I possess—and I can assure you it’s considerable—’ (Chancer, I thought) ‘if that boy is guilty of theft.’ I stole a glance at the other customers and saw most of them nodding their heads in agreement. We all went forward to drop earth on Duggie. As I bent, I looked down the four raw clay walls at his beautiful coffin. I thought of his dream of Freeman shoes when only one foot really knew the difference. The coffin was the same. I felt ashamed for having argued. Hedley Twidle is a writer, teacher and researcher based at the University of Cape Town. His collection Firepool: Experiences in an Abnormal World was published by Kwela Books in 2017. 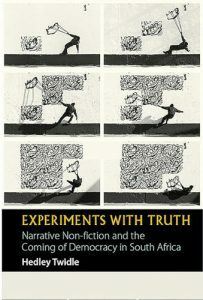 His next book, Experiments with Truth, will appear in the African Articulation series from James Currey in April 2019.